It seems logical to post first on the book I have read last, and it is Ferguson’s most recent work that lies resting beside the chair today. Niall Ferguson’s previous publications, The Ascent of Money: A Financial History of the World, Colossus: The Rise and Fall of the American Empire, and Empire: How Britain made the Modern World (amongst others) have placed him at the very pinnacle of contemporary historical analysis, particularly in the field of the classic historical survey. In this 402-page analysis of Western society, Ferguson continues to present a “big” history: an analysis full of imagination and sweep, yet lacking in substance, structure, or nuance. Unsurprisingly, the argument of the book is evident in the subtitle (The West and the Rest), as it was in Empire and Colossus.The six chapter headings, Competition, Science, Property, Medicine, Consumption, and Work signify the crucial factors or “killer apps” that determined the divergent courses that the West and East have taken. In fact, if you exclude the introduction, the core of the book has been reached already: the rest is extremely well- written narrative, with striking cross-references and intercultural connections. 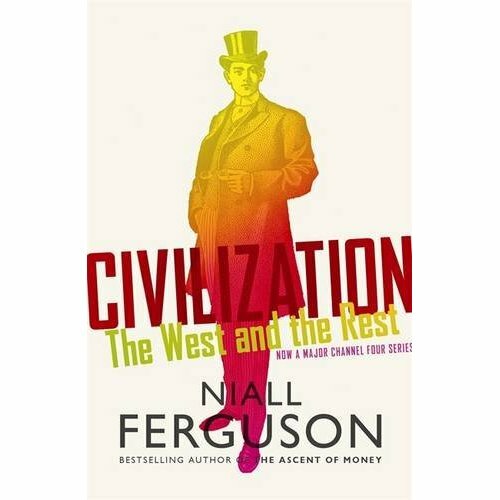 Ferguson is extra-ordinarily quotable and engaging; he has a capacity to place the reader comfortably within the early modern world, be it the Topkapi Palace in Istanbul or the Machu Picchu in the Andes, his attention to detail is masterful. “Civilisation” focuses on the grubby world of money and power, pop culture and exploitation as much as the beauty of art or the romance of the aristocratic world. This is a no-holds-barred view of our world and where we came from. Perhaps it is nostalgic, or even churlish, to say that the narrative sweep did not carry me away the way Braudel or Kenneth Clark ( who wrote similarly titled books) managed to when I was younger. Clark also wrote in conjunction with a television series, but it did not seem to affect the majesty and gravitas of his prose. Braudel- I’m not sure I’ll ever fully unlock the density of his writing, but I keep going back, and that tells a story in itself. Ferguson himself discusses these notions of civilisation in his introduction titled ” Rasselas Question.” It is in the preface and this section that you can perceive the ideological underpinnings of all Ferguson’s work; the schoolboy-like fascination with empire and its trappings, the need to answer the biggest of questions, and the balance between entertainment and information. However, I feel that his flamboyant narrative style is something to be applauded, not undermined. It is true that his argument appears flighty — he is so much sounder on matters financial — but he does raise questions that tantalise the reader: he is irritating by times, but fundamentally engrossing. If, like me, you find the eventual conclusions disturbing, I’m sure you will find the journey interesting! “If I had to choose between an erudite Aristotle and an unknown ‘soulless’ black slave I would choose the latter. The ascendancy of the West was on a heap of bodies of slaves and trampled humanity through colonization.” (page 135) My ‘readers reply’ to the so universal and germinal reviews strewn all over internet globe about Naill Ferguson’s book ‘Civilizations: West and the Rest’ will itself make a book. I say a book (for what I wrote in my book Mona Lisa does not smile anymore (ISBN 978-81-8465-512-4) on the “ascendancy of the West on the bodies of the Rest” would never have the kind of audience, the media, Harvard tagged Professor can muster. I am from the ‘Rest’, I am an Associate Professor in Delhi university and to get my own country’s newspapers and media to just read and review what I write in the book is akin to a beggar seeking the attention of an Emperor. I do not have access to big media houses, no media would have time to meet me while my own county’s journalists are talking and writing gloriously about the ‘West and the Rest’ as a great work of history. Though it is another matter the facts mapped on our psyche and on the bodies of our forefathers altogether offer different reasons for the rise of the West. The complete lack of moral unease of subjugating so many and killing so many through slave shipping, indentured labour, Colonization and a Church that helped in these grand ventures of the West is what Ferguson’s book tries to white wash. The writings of likes of Ferguson are unabashed neocolonial drivel in the garb of (partisan) academics of the West. His arguments smack of blatant superiority of the West and in a subtle whisper of ‘Christianity’ and by implication inferiority of the Rest. But so much is historically dark and gory under the white loaded brush of West that Ferguson can not whitewash it, even with the biggest brush. My book is about the morals of the West when Portuguese put Indians on stake under Inquisition in Goa, it is about the Colonial Jizya tax imposed by the British on Hindus, it is about 30 million Indians who perished under British Colonialism engineered famines and above all my book is about Humanism of India against the atrocities of the West of the time on the Rest. I am the blood and gene of the Rest. My maternal grandmother Subhadra Devi valiantly fought against the Colonial Portuguese seeking their eviction from Goa. (Charles Dellon in his book Inquisition of Goa (1687) has this to say about Indian prisoners of Inquisition “Some of these poor wretches …were so pressed by hunger as to be compelled to devour their own excrements” (page 28) quoted by me in my book at page 113. The Rest fought to get its human dignity back. What I say in my book Mona Lisa does not smile anymore will remain farther from the lights and glory for it has no guardian, no big publisher no saviour in the cause of the truth of the Rest. My book is more like an ordinary Indian-anguished and helpless. I will plod on outside of mainstream print and electronic media of India or of understanding West. For in India some of my own think the way Colonists did that we are white man’s burden. I must use internet, blogs, social sites, to say what be said in the service of truth and I owe it to that great fakir of my country Mahatma Gandhi. The question is not of the West or the East it is of respecting the truth of the suffering of millions across continents. To those in East or the West who stood up against injustice and inhumanity I dedicate sinewy truth in my tiny book. surely, prof ferguson has a lot of extra benefits in that most of the western academics in his field of interest will if they not outright applaud his book, at least review it, a chance most people of the rest will not get so easily, or not? well, there are some voices of people originating from what i will call the rest, who have managed by a dogged perseverance to voice critical opinions on the onslaught caused by western expansionism. here, vs naipaul comes to mind with his statement that the world is what it is. surely, it isn’t fair that western academics get an unfair share in intellectual interest, but would anyone from outside this ambit refuse such chances if they were offered? i lived most of my life and the rest but i was born in the west and i feel lucky having had these chances, which are very relative. if the esteemed writer of the reply to ferguson’s book were born on tristhan da cunha, he might not have had the chance to even voice his opinion on this webside…showing everything is very relative indeed. the one who comes most easily and eloquently to mind wrote in one his novels ‘the world is what it is’. the public sphere would get equal attention whether voiced by prince, pauper or fool.